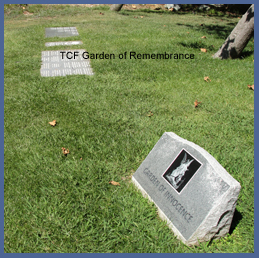 Our San Diego Chapter of TCF has been given a lovely garden next to the Garden of Innocence. Our garden contains large granite tablets on which any family can purchase 2, 3 or 4 lines of engraving dedicated to their child's memory. One stone shown above has been filled, but an additional stone is now in place. Those wishing to add their child's inscription on the new stone can get more information from either Barbara Lopez (619-660-5115) or Lisa Hohman (619-287-4253). Inscription forms are available. The price of engraving is $395. 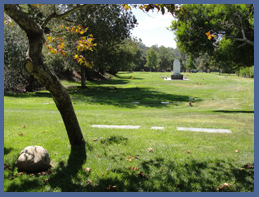 To visit this lovely and serene place, once in the park, walk due East of the flower shop to the end of Madonna lawn. 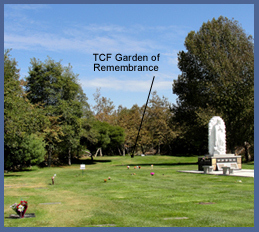 Our TCF area is to the left of the sidewalk as you enter the Garden of Innocence. You may wish to stay awhile in the shade looking back across the peaceful garden.